They were found guilty of the 2005 assassination of two judges. Among those put to death, leaders of renowned radical groups: Shaikh Abdur Rahman, of the JMB, and Bangla Bhai, del JMJB. Both groups fight for the introduction of Sharia in the country. Dhaka (AsiaNews/Agencies) – Six Islamic militants convicted of killing two judges during a wave of bomb attacks in 2005 were hanged at dawn this morning in Bangladesh. Among those put to death, the leaders of two infamous extremist groups: Shaikh Abdur Rahman of Jamaatul Mujahideen Bangladesh (JMB), and Siddiqul Islam Bangla Bhai, guide and leader of the outlawed group Jagrata Muslim Janata Bangladesh (JMJB). Both groups are held responsible for bloody campaign to introduce Islamic law in the country. “They were hanged in four different jails and their dead bodies were handed over to their families”, said Inspector General of Prisons Brigadier Zakir Hassan. In May 2006, were found guilty of attacks which led to the deaths of two judges in November 2005. The accused were also charged with a bomb campaign across the country on August 17th 2005 which left at least 30 people dead, along with 4 kamikaze; JMB claimed responsibility for the attacks. 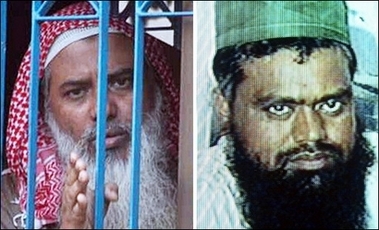 Jamaatul Mujahideen Bangladesh is held responsible for similar attacks on the country’s judicial system. The Islamic group wants sharia in Bangladesh. The provisional government which is leading the country in view of elections, fears r JMB reprisal attacks for this morning’s executions. Analysts explain this could be why they took place without warning and in separate prisons.